The modern homesteader is greatly misunderstood. Popular culture paints the picture of a backwards, back-woods, anti-social, stuck-in-the-1880’s personal. Some may believe that nobody even lives like that anymore. But just because we’re off the grid doesn’t mean we’re not with the times. Au contraire! my urban-minded friends. Homesteading is thriving and well connected in the 21st century – and is busy as ever preserving the simple life. “Homesteading” officially entered common usage in American English circa 1862 with the passage of the Homesteading Act. These laws encouraged folks to head out west and claim up to 160 acres of land for their families. Homesteaders raised livestock, ploughed the fields, built up barns, coops, cabins and outhouses and led a fairly self-sufficient lifestyle in small communities. The end of the Homesteading Act in 1975 coincided with a popular movement called “Back to the Land.” This movement was officially an exodus of hippies from urban centers to rural communes, but it also refers to anyone who wishes to live a more self-sufficient lifestyle. Modern-day homesteaders live in apartment buildings, crowded neighborhoods, suburban landscapes of every variety, as well as back-woods cabins and old farming plots. The very essence of “homesteading” is simplicity. And isn’t that what so many of us crave? Imagine the social ills that have simple and beautiful solutions when we live and work toward a simpler way of life. Want to lose weight? Why not trade in your gym membership for a garden? Want organic food? Homesteaders remember the days when everything was organic! Veggies came from your neighbor down the street. Meat and dairy from the farmer across town. The local bee-keeper is the best source for honey and pure beeswax, as well as many pearls of wisdom. Have you ever had raw goat’s milk kefir? Do you know someone with a flour mill? What will you do for medicine? There may be a “green witch” right next door, with just the right blend of wildcrafted herbs, medicinal syrups and tinctures for every cure (…and she’d gladly take a dozen eggs as barter!). 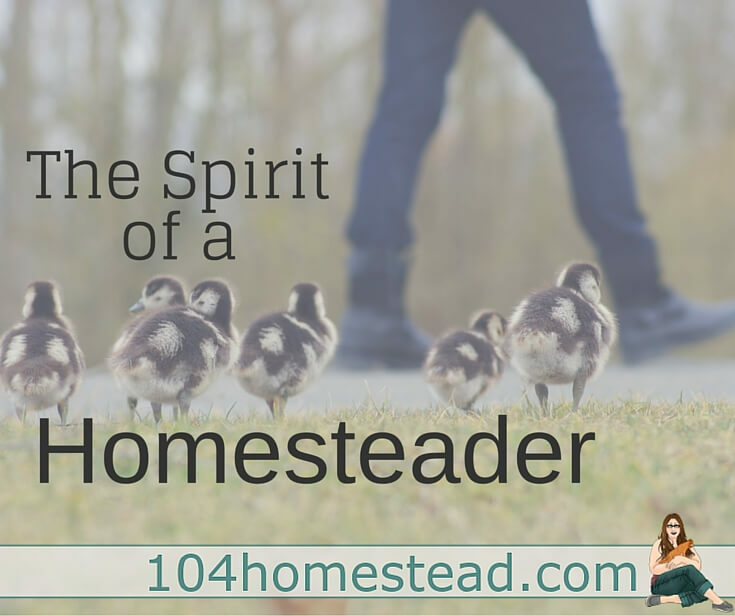 You, too, can be a Homesteader! “But I don’t have time for all that…” doesn’t fly, here. Sure you do! Pick one simple thing that you can do to be a little more self-reliant. Sprout an avocado, pick a dandelion for your lunch, walk instead of drive. Before you know it, you’ll be hooked. You’ll be asking “what if…” and learning new things all the time. You’ll discover your special homesteading talent and share it with your family and friends. Best of all, you’ll re-connect with the most ancient human rituals of planting and harvesting, of honoring the changes in weather and the seasons, and of living a self-sufficient lifestyle in a cooperative community. Happy homesteading! This article may be the most perfect thing I have ever read! The shock when I tell others I am starting to homestead. So many people are so stuck on the old version of homesteading, they don’t even realize what is happening in the world around them. Homesteading is a mindset. You have to sometimes think outside the box. You learn to reduce, reuse, and substitute. I’ve learned to bake chicken in a toaster oven, that 2 liter coke bottles can be turned into a self-watering planter, and that other people’s cast-offs can be turned into something unique with a little sewing skills. But it is something you can do anywhere in any situation. Right now we cannot live in an “ideal” place for homesteading, but we do so many things to have a simple life – line dry our clothes, small garden, cloth diapers, cook from scratch, bake our own bread, sew clothes for my little ones, etc. Maybe someday we’ll live where we can also have animals. Until then we’re just homesteading to the best of our ability where we are. That’s just the thing. You do the best with what you have. If you wait for “ideal”, the “ideal” may never happen. One of the things that I find most exciting is devising ways to (responsibly) use modern technology and methods to heal land and make it produce via old world truths. It’s funny,when people find out we grow most of our own produce and have chickens and bees they are shocked. I’ve never really considered us homesteaders it’s just what we do. Thanks for such an encouraging article. Awren, I love your blog. I have a garden & I can & freeze everything I grow. I make do with what I have & when I go to the store I buy in bulk. I would not have it any other way. I’ve been doing this since I was 17 & now I’m 61.